Today marks the twenty-year anniversary of the 1992 Marche des Chrétiens in the Democratic Republic of the Congo (DRC), a non-violent protest against the authoritarian regime of Mobutu Sese Seko that was violently repressed. Two decades later, the Catholic church picked this symbolic date, Thursday 16 February, as a day of non-violent mass protest against the recent presidential and legislative elections in the DRC—elections marred by fraud, irregularities, and as many as 1.6 million missing ballots. Yesterday, Wednesday 15 February, the government of the DRC declared the march illegal, claiming that its organizers failed to submit the necessary paperwork or march itineraries to the city hall for approval. The day of the march saw what some civil society actors have described as the most massive police deployment in recent history in the capital of Kinshasa. Despite heavy rain, a significant number of Congolese turned out for the march, congregating at parishes throughout the city. The police reacted, using batons and tear gas to brutally disperse groups of marchers before their numbers could grow. By the end of morning mass, police units had surrounded parishes throughout the city, trapping would-be demonstrators inside their churches and preventing them from marching. Reports have come in of priests being arrested and churches being raided by gangs of Kabila supporters. Police are apparently cracking down on any reporting activity, confiscating cameras and cell phones and preventing interviews of protesters. Radio Okapi, the UN-supported news outlet, has more information here (in French). 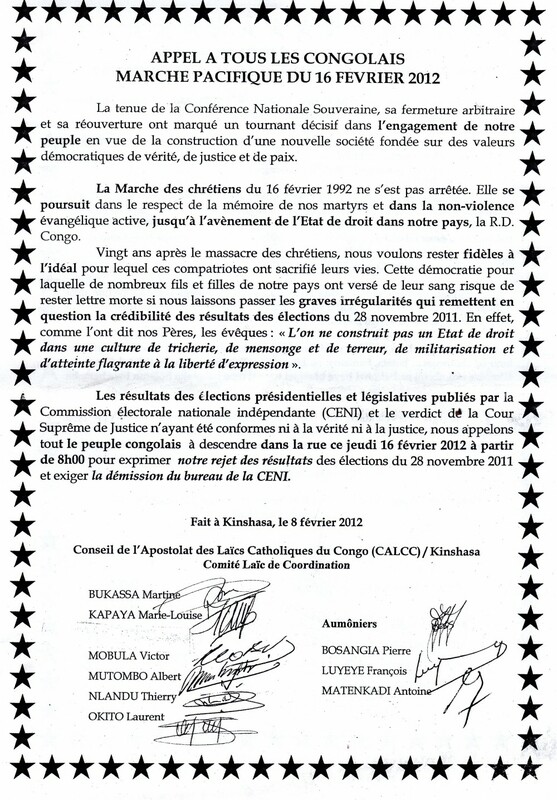 A coalition of non-governmental human rights organizations in the Congo (ONGDH) has issued a statement “denouncing attacks against Catholic parishes and police brutality” (available here in French as a PDF), describing the use of tear gas and water cannons by the national police against protesters, machete-wielding gangs intimidating marchers, and brutal beating of protesters (including onlookers) by security forces. The Observatoire des Média Congolais (OMEC), a media rights group, issued a statement (available here in French as a PDF) expressing concern over the confiscation of reporting material and targeting of journalists covering the protests. On 2 February, civil society groups in Katanga province called on the national army and police to address ongoing threats from Mai Mai groups. Four people were killed in a clash between elements of the national army and the bodyguard of an outgoing UNC deputy in the eastern city of Goma. The national army has intensified its operations against Mai Mai Yakutumba groups in the province of South Kivu. Journalist Edouard Diyi, director of Kasaï Horizon Radio Télévision, was held for questioning by the national intelligence services.